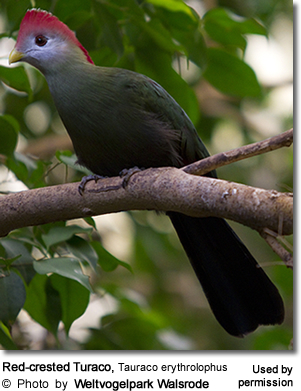 The Red-crested Turacos, Tauraco erythrolophus, are sometimes referred to as "Angolan Turacos." 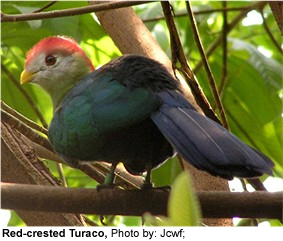 This turaco is monotypic (a genus consisting of only one species), but it forms a super-species with the morphologically similar Bannerman's Turaco. It is a resident breeder in the dense forest area of Central Africa, found in the Democratic Republic of Congo, Angola, Uganda, West Kenya, Burundi, Rwanda, southern Sudan and the Democratic Republic of the Congo (formerly Zaire). Its preferred habitats are woodland and forestry where it is able to feed on available fruits and berries. They also eat flowers, leaves, termites, seeds, acacia, figs, snails and occasional insects. The Red-crested Turaco is a fairly large, colorful, long-tailed regal bird. It is easily identified by its vivid red crest, white face and yellow beak. Eyes are red and the beak is yellowish-green. Its plumage is overall green. They measure 19 - 20 in (47.5-50 cm) from beak to tip of tail and weigh around 210-325g. Although they are social among the species, they are shy and remained concealed among the branches and seldom come to ground, except for water or food. Adults are similar to Green Turaco, distinguished by small all black bill and rounded whitish crest. This species has been very popular among aviculturists, and have been for a number of years. 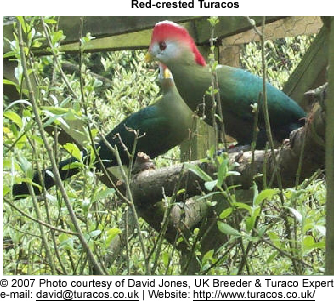 This turaco has been breeding readily in many collections. In captivity, breeders may feed these turacos Kaytee softbill pellets, as well as fruits and vegetables - especially greens. These turacos reach sexual maturity at about 1 - 2 years. During courtship, the male feeds, flaps wings to show red coloration, raises his crest, and flips his tail feathers. Hens lays two to three eggs in a loose nest made of twigs and some plant material around 3 or 5 meters above the ground. Both the male and female defend a territory and share with incubation duties. They incubate the eggs for 21 to 24 days, and the young fledge about 4 weeks after hatching..
Its call is a resonant "kwah khaw kwah."